Ah, the bagel. Among the simplest of breakfast foods, but delivered in a seemingly endless variety of ways. This quick breakfast option with plenty of heritage behind it has been a staple for a lot of working folks' lives, and thus, many places have opened up to provide these tasty options for folks on the run. Michigan is no exception here, so settle in, break open the cream cheese, and check out 10 great bagel places in Michigan! An extremely limited franchise, with locations in Ohio and Michigan alone, Barry Bagels can be found in Ann Arbor or Lambertville, and regardless of your location of choice, Barry Bagels looks to offer up a great new option in bagel. In fact, Barry Bagels' options are so complete there's even a bagel specifically geared for dogs on hand. Check out the soup and salad options, sandwiches, desserts, and even varieties of flavored cream cheese for a little extra thrill of discovery. Grand Rapids plays host to the Bagel Beanery—with other locations available—and has honored its bagel hero with the Grand Rapids' Best Bagel award fully 13 times. Lest you think that an unlucky development, check out the staggering array of bagels, homemade cream cheese options, and even locally-sourced coffee, which seems to be more locally roasted than grown, a development that makes sense given Michigan's climate. Throw in a tasty sandwich slate and seasonal drink specials and the end result is pure bagel joy. Even the Upper Peninsula isn't immune to bagel love, as demonstrated by the Huron Mountain Bakery. Found in Ishpeming—there's also a Marquette location—Huron Mountain Bakery offers 13 separate bagel options from the sweet (a sugar-glazed cinnamon raisin or blueberry) to the savory of tomato basil and jalapeno cheddar. Naturally, being a bakery, it doesn't stop there, so you can pick up a variety of other options to go along with your favorites in bagel. Not to be outdone, Marquette has a bagel place all its own in Third Street Bagel, which will offer not only straight up bagels, but also bagel options geared specifically toward breakfast and lunch. Whether starting simply with the scrambled egg, cheese and meat Breakfast Bagel or ratcheting it up to the Italian Bagel featuring ham, genoa salami, provolone and veggies with Italian dressing, the end result is a dizzying array of bagel options for most any time of day. Head out to Muskegon to get your hands on a Brooklyn's Bagel. Proud home of the $0.94 Large Latte, as a scrolling bar on the website will inform, Brooklyn's also boasts nitro-brew coffee and a host of options in bagels and toppings. Particularly recommended, reports note, is the Brooklyn Bomber, a massive bagel sandwich option featuring turkey, ham, bacon, and a variety of vegetables and condiments. It's easy to wonder how much research and development is conducted at the Detroit Institute of Bagels, found in Detroit proper. Based on the array of bagel options available, it might be easy to think that at least some research is in play here. Not only do they feature some noteworthy small-batch bagel options like jalapeno cheddar—that'll wake you up!—to a variety of shmear options like whitefish, spicy lentil and hummus, but they will also offer a complete “office pack” designed for sharing. Another great choice in Grand Rapids bagel, GR Bagel may only be open for a few hours every day—open Sunday but closed on Monday except for special order pickup—but those sufficiently driven to get in in that time have a great bagel option waiting. GR Bagel makes its bagels in a highly specific fashion that starts with fermenting the dough in advance, and then uses a mix of water and honey tea to boil the dough into what will eventually become bagels, resulting in a distinctive, chewy crust all its own. GR Bagel doesn't have a lock on the boiled bagel market, as Traverse City's Biga Better Bagels will demonstrate. 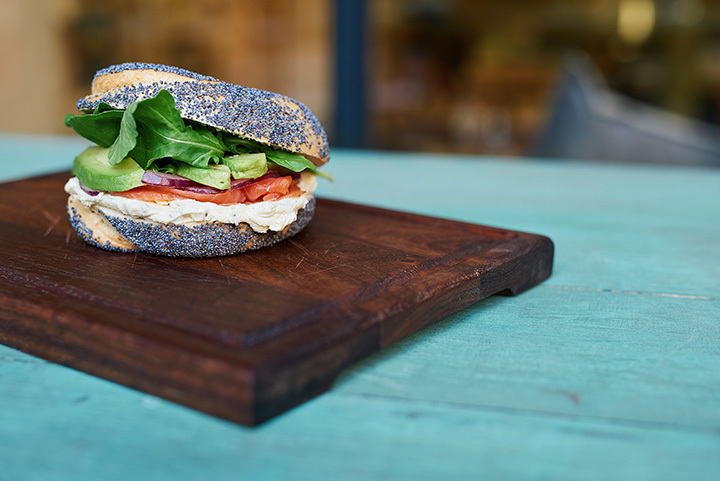 Featuring plain, fruit, and cheese bagels, along with six different flavors of cream cheese and a variety of breakfast and lunch options from there, Biga Better Bagels will use a boiled bagel preparation strategy, resulting in the chewier bagel that many expect from bagels. Good news for bagel buffs, and there will be plenty of coffee options to go along with that bagel. “Freshly baked for over 55 years.” That's the tagline that greets you at Detroit Bagel Factory in Detroit, which makes sense given the name. With over half a century of experience behind it, and 19 different classes of bagel ranging from asiago to whole wheat and a whole world of options in between—along with some traditional deli options for those craving a corned beef on rye—the Detroit Bagel Factory will send bagel buyers on their way with a magnificent bagel and a smile...along with some homemade whipped cream cheese. It's back to Ann Arbor for the final bagel stop on our list as MD Bagel Fragel brings it home for not only offering bagels, but also fragels. No, not those Jim Henson creatures—those are Fraggles—a fragel is something akin to a bagel, but different. Start with dough packed with raisins, then fry it and cover the resulting mass in cinnamon sugar. This is a fragel, and Ann Arbor residents swear by these. Part donut, part bagel, part cinnamon roll, it is the kind of treat that makes MD Bagel Fragel a special place. It's not just all fried sugar, though. Consider the Hickory Bacon breakfast sandwich made on a well-buttered bagel.